So, I was a little torn going into Eric. On the one hand, it's part of the Discworld series, which I really like. On the other hand, it's a Rincewind book, the installments that I find closest to tiresome. Eric follows Rincewind as he is summoned from the Dungeon Dimensions that he was trapped in at the end of Sourcery. Following an oddity in a demon-summoning ritual, he has been called to grant the wishes of a teenage Faust-wannabe named Eric. While the wishes themselves are standard enough (to be ruler of the world, to have the world's most beautiful woman, and to live forever), the magic that Rincewind suddenly has at his fingertips is determined to grant these wishes in the most awkward way possible. This is probably the first time that I've thought that Pratchett's writing benefitted by being shorter than normal. With most of his Discworld books thus far, I've gone away wanting more of what I just finished, which is kind of what I want from a book. 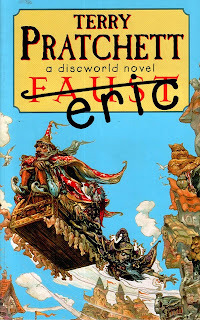 With Eric, while I'm more than happy to admit that it is by far my favourite of the Rincewind books so far, it's kind of obvious that there wasn't much substance to it. 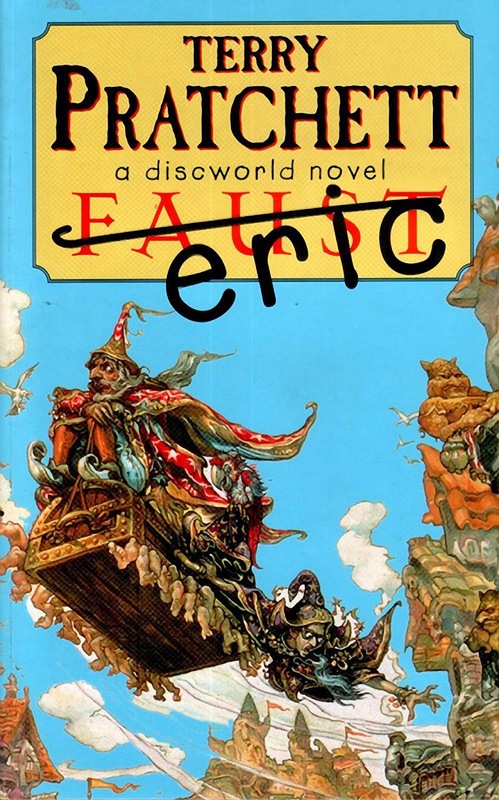 I can't imagine that I would have liked Eric half as much if it went on for a regular Discworld novel's length. It's main good point is its brevity. With regards to characters, my comments from previous Rincewind reviews still stand. I harbour a great love for the Luggage, and I still don't think that Rincewind works as a main character. As for the eponymous Eric, he's kind of a generic spotty teen. Occasionally he's amusingly ill-informed but otherwise there's not really much to him either. Like the plot, I could see him getting irritating if the material was stretched. any further.